With a long weekend ahead of us, my thoughts turn to home projects. A conversation about seating last night has prompted this post: a smattering of ideas for transforming chairs. My favorite? The DIY herringbone tutorial from Martha Stewart, above. I think the last link is wrong :( I want to pretty up my black office chair! Me too!!! please repost the correct link! Ooh, I'm thinking of using this technique on my daughter's crib! I need to repaint it anyway! Fabulous. I <3 that herringbone!!! Oops, sorry guys! I've fixed the link. 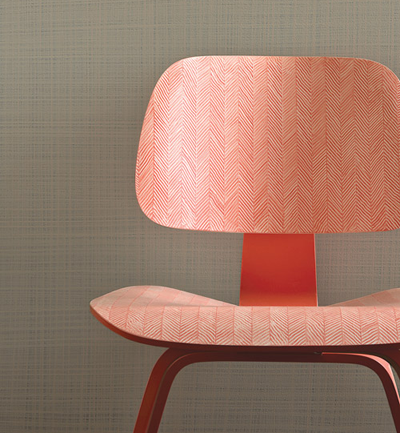 I love the herringbone paint treatment, though I don't think I could ever touch a brush to the beautiful Eames! Instead, I tried it on an IKEA step stool and it came out great! I did mine in green and white. I'm liking the stripey chair, too! I would make a royal mess of that herringbone project! Actually, I'd probably make a mess out of all of these! Very clever ideas, though. I love the 1st chair! Thanks for sharing my link on your blog!! I just LOVE that herringbone chair!! omg, you're killing me with that herringbone. Wondering what YOU're going to be working on this weekend! ?? In our blog http://lascreacionesdebeaynatalia.blogspot.com/ , we've dedicate some post about reusing and reciclying. We've visited some blogs that show us to do it. One of them is HOW ABOUT ORANGE, so we invite you to visit our blog. The blog is in Spanish, but you can use a gadget to translate it. Thanks! Love that green polka dot. It's cheerful! 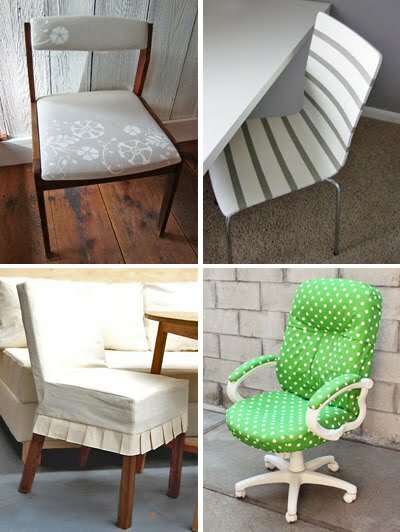 Ooh, that green polka-dotted one gives me an idea for my wretched hand-me-down desk chair...although I should just get one that doesn't make my shoulder hurt...at least it can be pretty in the meantime! The top chair is my fav! I wonder if these projects are tricky. I love how a splash of paint or your favourite fabric can really transform an ordinary piece of furniture! Love these ideas....I added a link to this page on my blog. Thanks again for the inspiration!